Is Marketing An Industry In Denial? I was recently fortunate enough to read through a fascinating piece of research published by our friends in Twilio. I say fortunate - but it’s available to anyone who wishes to download it and I strongly recommend you do. 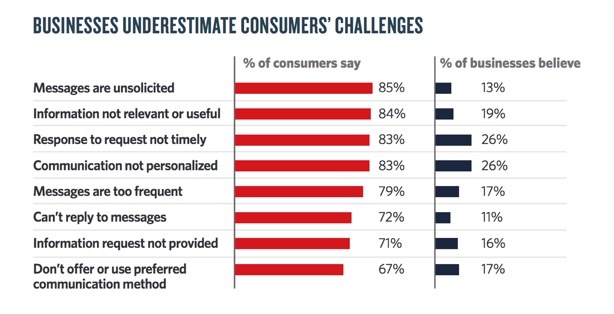 The research, which to my untrained eye appears to meet the requirements around sample size so often ignored by tech companies in search of a headline, takes a high level look at the perceptions of marketing and communications held by consumers on one hand and businesses on the other. It makes for interesting reading to say the least. Amongst a variety of fascinating facts relating to how brands and consumers prefer to communicate with each other, the table below leapt out at me. It asks consumers and businesses to agree or disagree with a range of statements about the communications that the latter send to the former. You might expect them to disagree here and there. But these numbers are a revelation. And not in a good way. If you skimmed over that table, go right back and take another look at it. This isn’t a slight mismatch or minor difference of opinion. This is an industry that has literally no idea what perception their own customers have of their communications. And more significantly, that perception is overwhelmingly negative. We don’t have time to unpick every individual response but I think it would be fair to say that whilst businesses are saying “we are sending our customers and prospects relevant and useful communications”, consumers are firmly voicing the opinion that “you are spamming me”. That’s a huge problem for all sorts of reasons, not least those noted later in the same report in which the true cost of poorly targeted and unhelpful communications is laid out. Marketers, and I say this as a member of that august group, can be prone to imagining that consumers actually like advertising. It can at times appear inconceivable that the 4 million people I sent details of my “special offer” to earlier that day may not have welcomed that particular communication with open arms. But I suggest that all of us in the industry need to start listening carefully to what consumers are saying, and taking steps to bridge what I call “the relevancy gap”. Fortunately, there are ways to do just that. The first is the change of attitude I mentioned above. Start putting yourself in the customer’s shoes and behave accordingly. Is this particular communication really helpful right now? The second is to follow up that thought with another: ‘what if I started to think of communication more in terms of service provision than marketing?’ In other words, start from the ways in which your business or brand can be helpful (genuinely helpful, no more fooling ourselves) to the consumer during their day, and work outwards from there. Even within that first bullet point lies a wealth of information relating to which device they prefer to use for communication, the time of day when communication is likely to be effective, and of course what types of communications might be appropriate right now. We need to use this data. We need to start talking to our customers and prospects when they want, and how they want. We need to work harder than ever to bridge the relevancy gap. The alternative is consumers turning off: and nobody wants that.